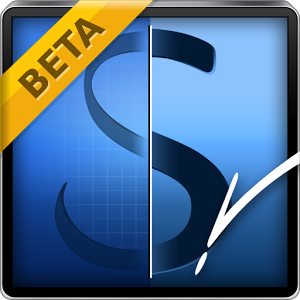 MyScript® Stylus™ Beta is an interactive handwriting recognition application that allows real-time text input on touch-screen devices designed for fingertip/stylus use such as mobile internet tablets or smartphones. Help refine and polish MyScript® Stylus™ Beta before we officially release it. Designed for all types of touch-screens (capacitive, multi-touch, …), MyScript® Stylus™ Beta is an alternative to onscreen and physical keyboard in any application requiring text entry such as SMS, MMS, email, text editor, calendar, task manager, web browser, directory, etc. • The handwritten input is converted into digital text in real time in the active application. To help users write long words and phrases, the writing area scrolls over progressively. MyScript® display orientation can be switched on the fly from portrait to landscape by simply rotating the handset. • For each word, a list of alternative results appears in case the recognized word is not the expected one. MyScript Stylus BETA doesn’t collect any of your data (Credit cards or any other information). We only convert your writing to digital text. An operating system message will warning you about “Any input method can still your information”, this is an automatic message that Android displays for all downloaded text input applications (Keyboards, etc.). Languages available for the User Interface include: Arabic, Chinese Simplified, Chinese Traditional, English, French, German, Italian, Japanese, Korean, Portuguese and Spanish. MyScript® Stylus™ Beta recognizes natural handwriting in 54 languages. It also supports cursive English recognition when combined with Asian languages (Chinese, Japanese, and Korean). Thanks to all for your useful feedback!